iDive for Mac is the must-have tool for cataloging and organizing all your videos. iDive for Mac allows you to import any video file format that can be opened by QuickTime and keep track of your videos, CD's or DVD's. 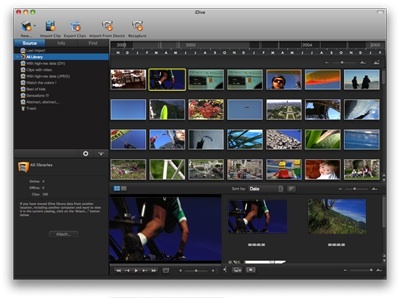 iMovie users will find a tool that lets them browse through all their projects and catalog clips captured in iMovie. iDive for Mac scans tape after tape to build an index of your DV Library. ...... If you want, iDive for Mac can also record the whole clip or simply index your footage by taking sample frames in full resolution. iDive for Mac is the ideal cataloging solution for all your movie files as it features QuickTime import capabilities allowing you to keep track of all video files whether they come from a camcorder, are downloaded from the Internet, stored on a hard drive or from CD/DVD. Whether your video collection is stored on a memory card, DVD, hard drive or even video cassette, iDive for Mac allows you to easily identify, sort, organize and catalog all footage for easy access and use in a central hub. Qweas is providing links to iDive for Mac 2.0.3 as a courtesy, and makes no representations regarding iDive for Mac or any other applications or any information related thereto. Any questions, complaints or claims regarding this application iDive for Mac 2.0.3 must be directed to the appropriate software vendor. You may click the publisher link of iDive for Mac on the top of this page to get more details about the vendor.